Santa Maria crater, about 295 feet (95 meters) wide, dominates the scene in this 360-degree view from NASA's Mars rover Opportunity, taken on Dec. 16, 2010. Opportunity will likely stay at Santa Maria until early February 2011, then resume its trek toward Endeavour crater. SAN FRANCISCO ? NASA's Mars rover Opportunity is chuggingtoward some interesting mineral deposits on the rim of a fresh crater, guidedby a sharp set of eyes from above. Opportunity arrived at Mars' Santa Maria crater in the lastfew days, and it should make it to the crater's southeast rim in a few weeks.Once there, it will investigate a patch of minerals that likely formed in thepresence of water billions of years ago, researchers said here today (Dec. 16)during a press conference at the 2010 fall meeting of the American GeophysicalUnion. The rover knows where to look thanks to NASA's Mars ReconnaissanceOrbiter (MRO), which detected the minerals, known as hydrated sulfates,from 150 miles (250 kilometers) up while circling the Red Planet. This level ofteamwork between rover and spacecraft is unprecedented, researchers said. "It's the first time we've used minerals detected fromorbit to drive where a rover should go," said Mars Exploration Roverdeputy principal investigator Ray Arvidson, of Washington University in St.Louis. MRO detected the hydrated sulfates on Santa Maria's rimusing its mineral-mapping spectrometer. Opportunity wasn't too far away, so therover team decided to send the rover over for a closer look, researchers said. The Martian surface is bone-dry today, but hydrated sulfatesand clays ? which also form in the presence of water ? reveal that the planetwas once a much wetter place. But that was long ago; scientists think the claysare 4 to 4.5 billion years old and the hydrated sulfates are about 3.8 billionyears old. Craters provide a way for scientists to probe such ancientrocks, which would otherwise remain buried and out of reach. "These are nature's drills to expose the bedrock,"Arvidson said. 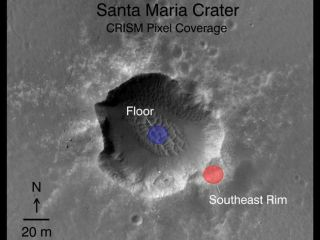 And Santa Maria is special as far as craters go, he added.The crater appears to be extremely young in the geological scheme of things ?perhaps just a few million years old, Arvidson told SPACE.com ? so its surfacehasn't been too grimed over by weathering. "We've never seen a crater this fresh, this big,"Arvidson said. Opportunity should soon get a good, up-close look at theminerals on the southeast rim. When it gets to the area in the next few weeks,the rover will verify MRO's orbital observations and also collect more in-depthdata, researchers said. The Santa Maria stop marks a slight detour for Opportunity,which is making its slow, steady way to a giantcrater called Endeavour. The rover turned its wheels toward the 14-mile (22-km)-wide Endeavourin the summer of 2008. Opportunity has since covered about 9 miles (14.5 km),with about 3.7 miles (6 km) left before reaching the crater, researchers said. And MRO will help guide Opportunity the rest of the way. Theorbiter has detected clays at Endeavour, and it has found clays and hydratedsulfates at various other spots, helping scientists plan Opportunity's route.The goal is to investigate and characterize the ancient Martian environment, tohelp determine if the planet may ever have been capable of supporting life,researchers said. Last year, Spirit got boggeddown in soft sand, and it stoppedcommunicating with Earth in spring 2010. NASA officials haven't given uphope of hearing from the rover, though. "We're listeningnow," said rover project manager John Callas, of NASA's Jet PropulsionLaboratory in Pasadena, Calif. "We've been listening every day." But Callas said thatpessimism is definitely in order if Spirit hasn't made a peep by March, whenthe Martian sun will be strong and the rover will have had plenty of chances towarm up and power up.